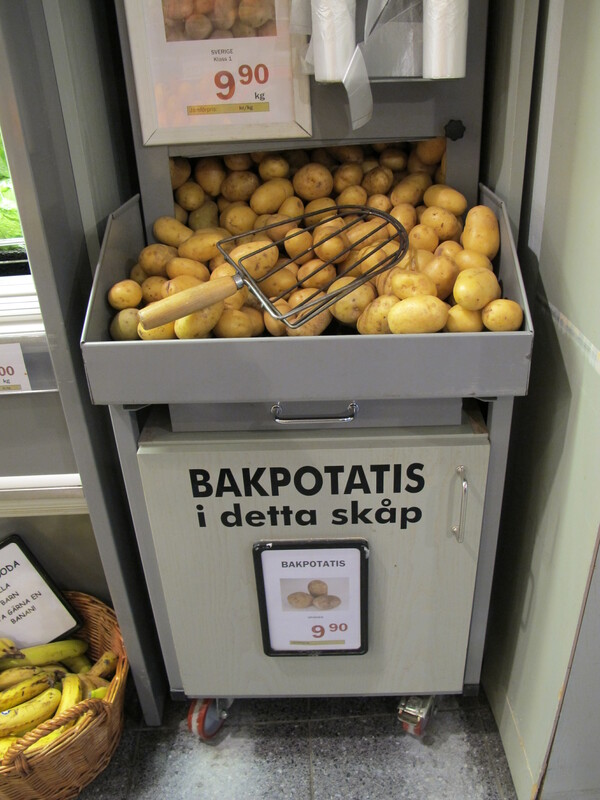 Now here is a riveting post……baked potatoes in Sweden. What could possibly be so different? Well, for someone who grew up in northern Utah bordering Idaho Russet potato country, the answer is….a lot. I miss fluffy Russet baked potatoes so much that they are always on my list of “must eat” when I travel back home. When we lived in the U.S., my husband and I used to regularly enjoy a baked Russet potato for dinner topped with something like steamed broccoli, bacon, cheese, or sautéed onions (in the best world ALL of those things were on top, including sour cream). So the first time I saw baked potatoes on the menu in Sweden, I was pretty excited and ordered one straight away. Five years later, I’m still adjusting to the difference, but feeling the Skagenröra love. 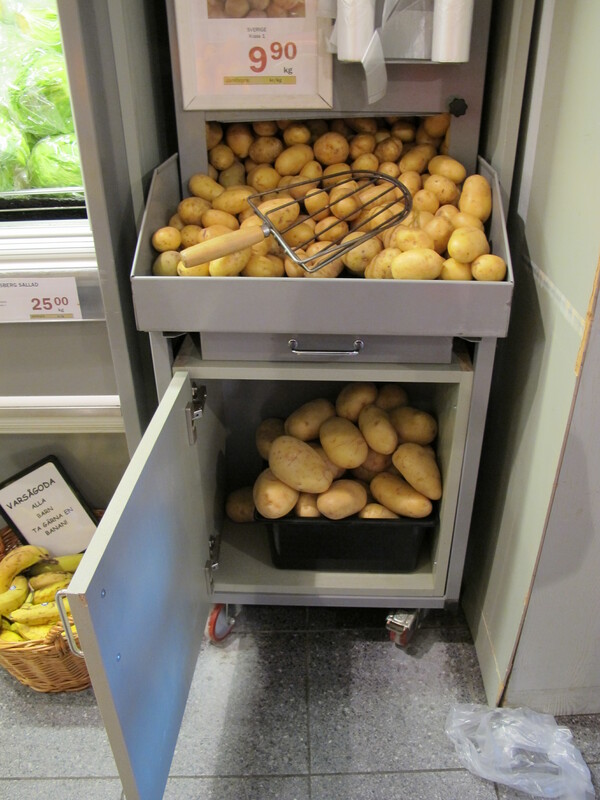 For a long time, I thought you couldn’t get baking potatoes at the store, just in restaurants, until someone explained that I needed to look for the special door/drawer with the proper size of potatoes. I don’t know what variety they are, but they are not Russets, and they can be incredibly big. They essentially seem to be giant-sized regular potatoes with a very thin skin. For a country that takes potatoes very seriously and clearly labels all varieties of potatoes in the store, these giant potatoes just get labeled “bakpotatis,” or baking potato. Other than the variety of potato, the biggest difference between the toppings in Sweden and what I was used to in the U.S. is that all of the toppings here are COLD. Super hot, steamy potato, with cold sauce on the top. It’s generally a sour cream, creme fraiche, and/or mayonnaise based sauce and the potato always comes with a tiny coffee spoon, which is beyond me. I have no idea why a spoon is needed for this occasion, nor why it is small. Although I still find a cold topping strange, it does have the advantage of that when you mix it into the steaming hot potato, it evens everything out temperature wise leaving you with a palatably tepid potato rather than having to wait for a scorching hot potato to cool off. Another difference is that most people here wouldn’t dream of eating the skin which is one of my favorite parts. The trouble is that since people aren’t expected to eat them, I have found that they tend to have dirt on the bottom which makes for a not-so-nice finish to your meal. Recently I ordered a baked potato with shrimp at the new swanky mall in town and was shocked to be asked if I wanted it topped with cottage cheese. That was decidely a “no,” particularly since I have become accustomed to these heavy-laden baked potato toppings that are so sommon here. Typical versions of toppings always include a substantial sauce with chicken curry, salmon, roast beef, or a shrimp topping called Skagenröra, which translates to “Skagen mix.” Skagen is an area on the northernmost tip of Denmark that is known for its shellfish and Skagenröra is definitely my favorite Swedish baked potato topping. 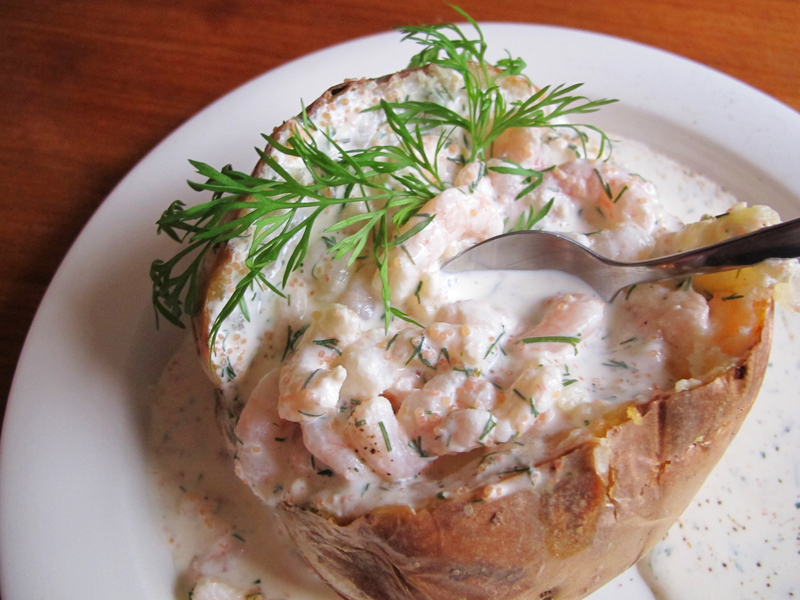 A soupy massing spilling out of a baked potato is not the most photogenic of food items, but this is typical Swedish lunch fare. I truly look forward to baked potato day at my office cafe, and I have learned that I am not the only one. It actually makes my day when I see the shrimp-filled baked potato on the daily special (it’s the little things in life…..). 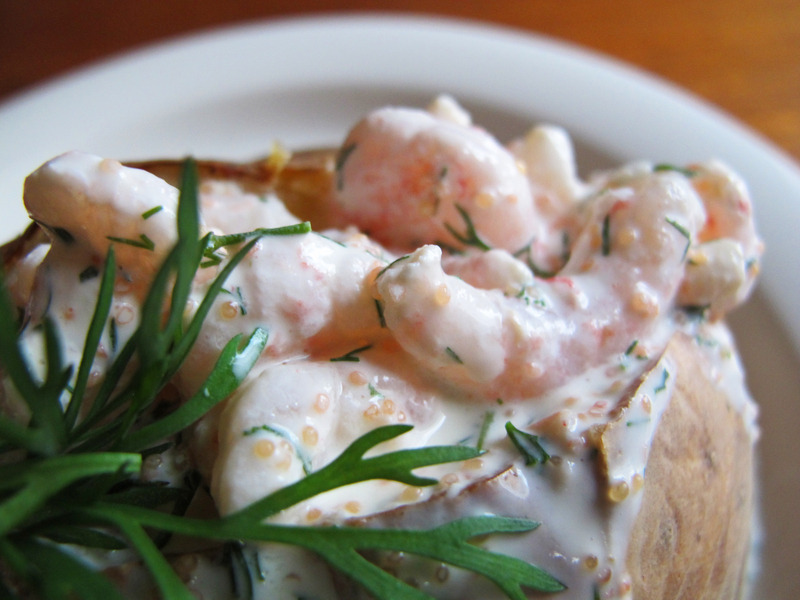 I find it to be incredibly Swedish with the lovely Swedish shrimp, a hefty sauce, caviar, and dill. So if you are in the mood for a change from the hot baked potato with steamy toppings and melted cheese, give the Swedish way a try. And don’t forget to complete the experience with a tiny coffee spoon. You can use a mix of regular and light creme fraiche, or all light, all regular, and/or throw in some mayonnaise and/or sour cream to suit your own taste. Use bay shrimp, or the tiny Nordic shrimp. Combine all of the ingredients, mix well, and serve as a topping on a steaming hot, baked potato (with a tiny spoon alongside). You are most welcome. Enjoy your foray into the world of cold toppings, Swedish style! Wow. So very different. The coffee spoon makes me laugh. I know! It makes me laugh too…..still! If I were stranded on a desert island, and could only eat two foods for the rest of my life, I would choose shrimp and potatoes. No lie. baked potatoes for sure, but no thanks on the shrimp. and being a lifelong baked potato eater, I can appreciate the little spoon. Never tried it before, but I’ll do it tonight after i get some good bakers at Whole Foods. I prefer butter on my spuds. Had enough of the sour cream and that in my youth. but a few good knobs of butter, and I’m in heaven!! 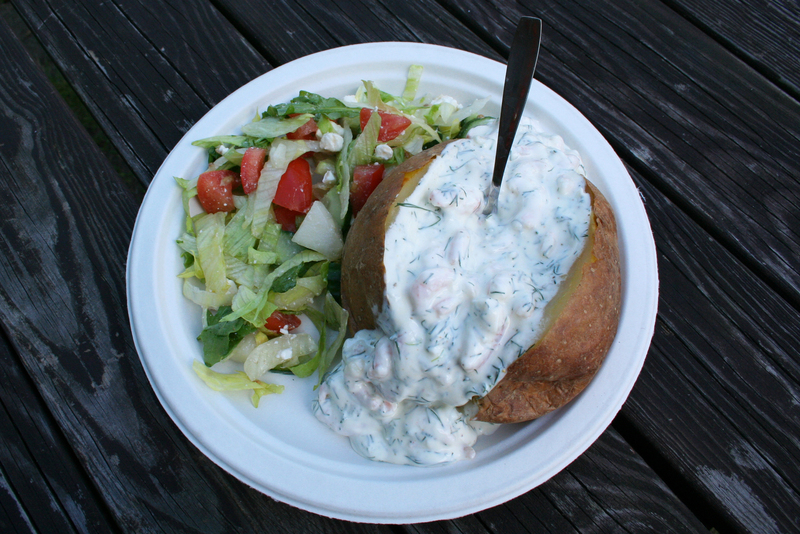 Actually, you should add cottage cheese (keso) to your skagenröra for your potatoes, and reduce the amount of creme fraiche – I would be surprised if you didn’t find it even more delicious.